By mid-afternoon on a busy January weekend, the main Meadows parking lot has already begun to empty. “Mt. Hood Meadows Ski Resort Twilight Parking Lot. Without more specifics, it’s hard to know just HOW bad this idea is, except that “permanent removal of vegetation” in a “new 12.6 acre opening in the forest” might qualify for some kind of award for obtuse new euphemisms within the federal bureaucracy. Yes, it’s another parking lot. Where is the new parking lot “behind the sand shed” proposed? We don’t know yet. We also know that ODOT, the Mount Hood National Forest (MHNF) and the ski resorts really aren’t very interested in managing peak resort demand to minimize the need for more parking and wider highways. Beyond an anemic fleet of ski buses, there is no plan. So, this looks like more of the same, and another patch of subalpine forest will soon be erased from the slopes of Mount Hood. The sprawling Hood River Meadows lot is mostly empty nine months of the year -- this panoramic view is on a beautiful March weekend with a 12-foot snowpack on the ground, but when most skiers are busy doing other things. Here’s the real tragedy: like the highway widening projects proposed along Highway 26 west of Government Camp, the string of parking lots at Meadows are really only used a few days each year — a few busy weekends in December, January and February, when the Meadows resort is briefly crowded to capacity. 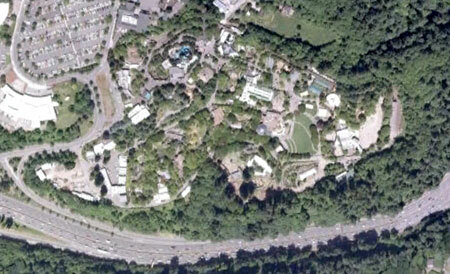 But a look at the Hood River Meadows lot on a sunny March weekend (above) tells the real story. These parking lots mostly sit empty for nine months each year, and only fill on weekends during the 3-month “busy” period each winter. There is a better way. The Mount Hood National Forest and ODOT could tear a page from the Deschutes National Forest playbook, and take a serious look at managing weekend crowds with a Paul S. Sarbanes Transit in the Parks and Public Lands Grant. What the is that? Well, it’s how the Deschutes NF will partner with nearby Central Oregon communities to examine the possibilities for a different transportation solution for the few winter peaks that stress the transportation system than simply putting down more asphalt. Here’s the news release (PDF). The South Park Blocks in Portland stretch 12 blocks, and cover just nine acres in area. All twelve blocks would fit inside the proposed Meadows parking expansion, yet manage to include one of Portland’s largest forests of century-old elms, along with numerous fountains, monuments, plazas and walkways. Of course, in many cities, it would just be 12 more blocks of surface parking. Looking rather brown in this post-Rose Festival restoration view, Tom McCall Waterfront Park is also about 12 blocks long, and covers about 13 acres. This park also manages to incorporate a number of fountains and monuments, pathways, the sea wall, plus the entire Rose Festival midway every June, as well as dozens of other festivals and concerts over the course of the year. In the case of McCall Park, 13 acres covers a lot of terrain, but it also has a surprising history: this stretch of land was once Harbor Drive, a 4-lane highway, that city leaders tore out and replaced with a park. The Oregon Zoo covers 64 acres, but the Great Northwest Exhibit only covers about a 12 acres, and is comparable to the Meadows parking proposal. Like the forests around Mount Hood, the Northwest Exhibit is home to cougars, bald eagles, black bears and salmon — plus mountain goats, river otters, sea lions and sea otters. Holladay Park, the Lloyd Cinemas and the very large cinema parking lot in between fit into a space of about ten acres in Portland’s Lloyd District. By comparison to the 12-acre Meadows proposal, the four acres that fall within the cinema parking lot provides 550 parking spaces — therefore, a similarly designed lot on the acreage Meadows proposes to develop on Mount Hood would translate to 1,650 spaces! Is this possible? 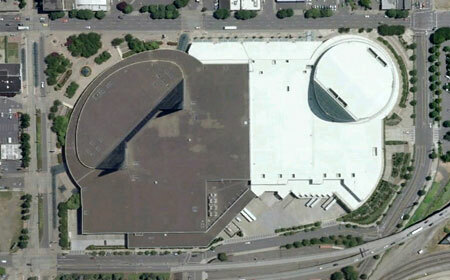 The Oregon Convention Center also fits neatly on about 14 acres, providing 1 million square feet of convention space, plus numerous plazas and walkways, a light rail station and truck loading bays. Unlike Meadows, the Convention Center didn’t have the luxury of simply paving over a nearby forest for overflow parking, and thus the underground structure with space for 800 vehicles. 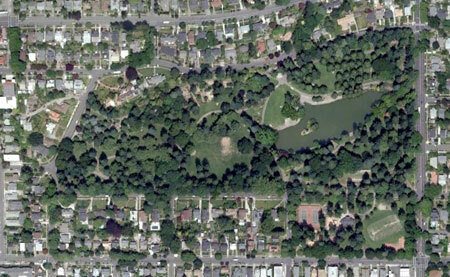 Finally, Laurelhurst Park is about twice the acreage of the proposed Meadows parking lot, at 26 acres. But it gives a good visual of what the ski resort proposes to pave over with their lot. Simply imagine “permanently removal” of the vegetation on one half of Laurelhurst park, above, replaced by a parking lot. On its 26 acres, Laurelhurst provides a concert stage, numerous monuments and art displays, tennis court, volleyball court, basketball court, soccer field, horseshoe pit, play area, picnic sites, off-leash pet area, restrooms, network of paved and soft walking paths and an interpretative historical sites — which half should be paved over for overflow ski resort parking? 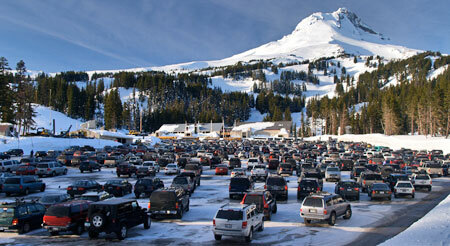 What will be the fate of the latest Meadows proposal to build parking on Mount Hood? Hopefully, the Forest Service will act as protective stewards of our public lands, and see more value to a 12.6 acre piece of forested land than just a bunch of trees that should be “permanently removed” to make room for skiers during a few winter weekends. We’ll see. As details about the latest Meadows parking lot expansion are revealed, updates will be posted here, including opportunities to weigh in on the plan. After all, every acre counts, and all 12.6 acres belong to you and me, our children and their children, not the Meadows resort development. This entry was posted on August 15, 2010 at 8:44 pm and is filed under Proposals. You can subscribe via RSS 2.0 feed to this post's comments.